Denmark and Ireland are both small, open economies and both countries experienced housing bubbles followed by housing and financial busts between the late 1990s and the present day. While the nature and extent of the housing and financial crises experienced by each country differs (Ireland’s experience being significantly more volatile), the experience of their respective social housing sectors differs still further. Funding and output for social housing in Ireland was high during the housing boom and collapsed following the crash of 2008. In contrast, Denmark reduced social housing output during the boom and was able to increase it significantly following 2008. 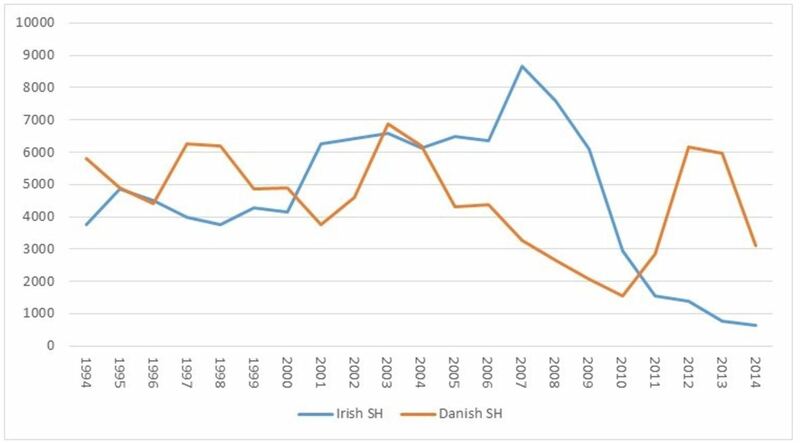 These contrasting dynamics go some way to explaining why Ireland is currently facing an intense housing and homelessness crisis while Denmark is not. Because Irish social housing provision collapsed in tandem with private housing output the country currently faces an acute supply shortage, particularly with regard to affordable housing, and a consequent homelessness crisis. Denmark, on the other hand, has been able to increase social housing supply significantly since 2008 and thus offset the impacts of the decline in private sector output. At the heart of this is the relationship between social housing and the dynamics of the private housing market and the financial system. 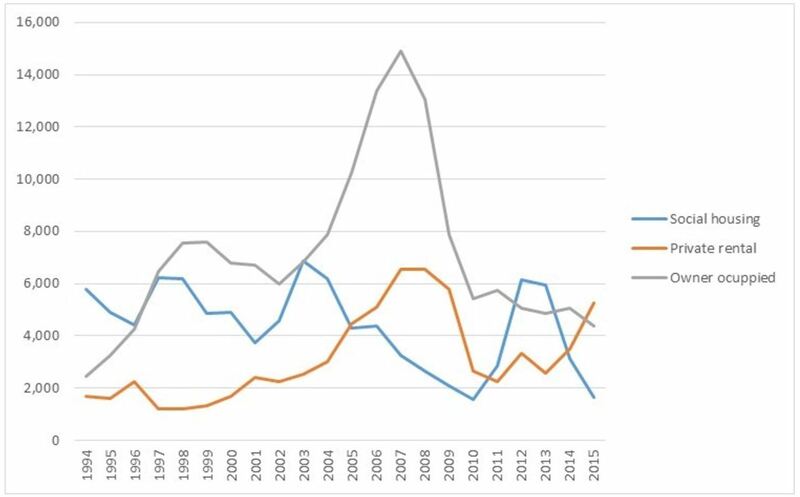 We argue that social housing finance is key to understanding this dynamic and that it is the very different ways of financing social housing in Ireland and Denmark that explains their contrasting experiences during the boom/bust period associated with the global financial crisis. Closer examination of social housing finance, however, produces somewhat surprising finances. Social housing in Ireland is entirely funded by capital grants from central government and as such it is publicly funded. Yet, as indicated in the graphs below, this system was more closely tied to the boom/bust cycle of the housing and financial markets than its Danish counterpart, which is majority privately financed. Housing output in (dwellings completed) Ireland and Denmark 1994 – 2014. Source: Danish Transport, Construction and Housing Authority and the Irish Department of Public Expenditure and Reform (various years) and Department of the Housing, Planning and Local Government (various years). Total Housing Output Denmark (Excluding cooperative sector) 1994 – 2015. Source: Danish Transport, Construction and Housing Authority. 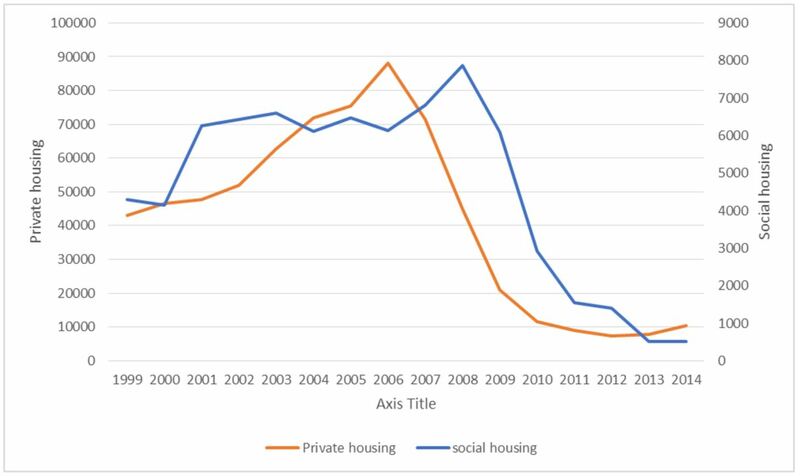 Social housing and private housing output in Ireland, 1999 – 2014. Source: Irish Department of Public Expenditure and Reform (various years) and Department of the Housing, Planning and Local Government (various years). In order to explore the relationship between social housing finance and private housing and financial markets, we deploy the concept of financial circuits (Halbert and Attuyer, 2016), as well as drawing on Sokol’s work on ‘financial chains’ (2015). Halbert and Attuyer conceptualise ‘financial circuits’ as “sociotechnical systems that channel investments in the forms of equity and debt into urban production” (Halbert and Attuyer, 2016: 1347). Similarly, Sokol (2015: 2) theorizes what he calls ‘financial chains’ as both ‘channels of value transfer’ (between people and places) and ‘social relations that shape socio-economic processes and attendant economic geographies’. In analysing social housing financial circuits in Ireland and Denmark, we develop the concepts of ‘cyclicality’ and ‘leakiness’ as two lenses through to capture the interaction between social housing and private housing markets and financial systems. Ireland’s social housing financial circuit is ‘pro-cyclical’ and ‘leaky’ whereas the Danish system is ‘counter-cyclical’ and ‘contained’. It is this difference, rather than whether or not social housing is publicly or privately funded that helps to explain the divergent experience of our case studies. The concept of financial circuits can thus be used to draw out and highlight the sets of material intuitions and practices which make possible and structure certain relationships between finance and the built environment. It thus allows us to sidestep more general categories and concepts through which housing finance is typically framed, such as public and private, market and non-market and so on. This suggests that theorisation of the financialization of housing should take into account not just the extent to which a particular sector of housing or aspect of the built environment is subject to investment by financial actors, but also pay close attention nature the financial circuits which make this possible, for example by examining the trajectory of value produced within a given circuit, in the form of rental streams, equity or interest payments. This, we argue, is likely to shape the extent to which housing within a given circuit is subject to the economic logic of private finance, i.e. the reduction of housing to an income yielding asset. Thinking beyond the dichotomy of public and private finance opens up an important avenue for critical reflection, particularly in the current context in which many cities face acute crises with regard to the availability of affordable housing. We refer here to the possibility of using private finance to provide investment in de-commodified housing (and possibly other forms of public infrastructure). This raises the question of to what extent private finance can be subordinated to democratic processes and to logics other than that of rentierism and speculation. Of course these questions will remain open, but given the extent to which wealth is concentrated in the financial system and the urgent need for investment in infrastructure and affordable housing, they are certainly questions worth pursuing. Halbert L and Attuyer K (2016) The financialisation of urban production: Conditions, mediations and transformations. Urban Studies, 53(7), 1347-1361. Sokol M (2015) Financialisation, financial chains and uneven geographical development: Towards a research agenda. Research in International Business and Finance. Read more in the Financial Geography Working Paper #5.